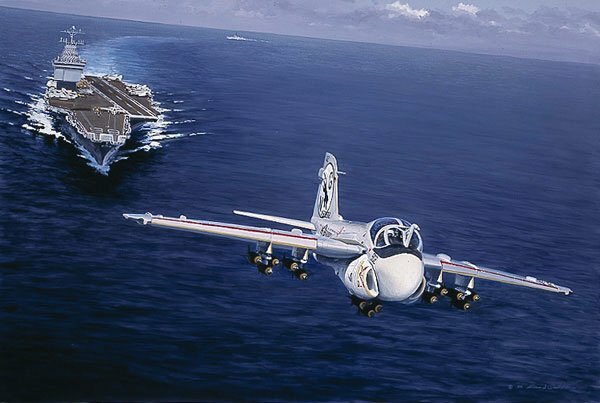 The painting occurs at the start of "Red" McDaniel's 81st Vietnam combat mission in 1967, taking off from the aircraft carrier USS "Enterprise" from the South China Sea in an A-6 Intruder. It was an Alpha Strike which means a full press. It was on this mission that he was shot down. He was held captive for six years. What makes him special is how he survived the torture of his captivity. When he returned home, he was awarded the Navy's highest award for bravery, the Navy Cross. Among his other military decorations are two Silver Stars, three Bronze Stars and two Purple Hearts for wounds received at the hands of his torturers.